Jaguar Land Rover, Daimler and Fiat Chrysler were Europe's fastest-growing automotive groups last year. 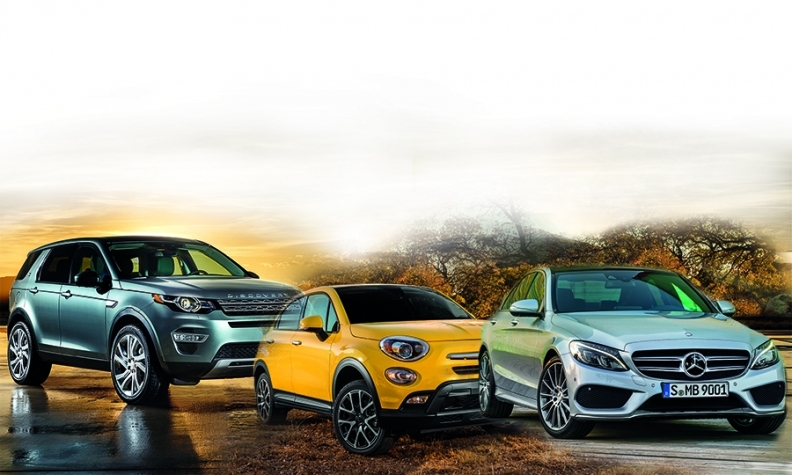 The Land Rover Discovery Sport (left) boosted JLR's sales, the Mercedes C class (right) lifted Daimler and the Fiat 500X (center) was a big success for Fiat Chrysler. Jeep, Smart and Jaguar were the biggest winners last year among automotive brands sold in Europe, where overall vehicle sales rose 9.2 percent to 14.2 million, easily exceeding initial analyst expectations that the region’s volume would rise by a maximum of 3 percent. The reasons for the better-than-expected sales were Europe’s overall economic improvement, better macro conditions, and “a natural catch-up process after the longest sales downturn Europe has ever suffered,” analysts at IHS Automotive said. Also helping were government stimulus packages and automaker incentives, IHS said. Pushed by the Renegade small SUV, Jeep was the fastest-growing brand in the region with a rise of 113 percent. It’s the second year in a row that Jeep has been No. 1 in this category. Smart was No. 2 with a 72 percent increase that came because it added a new-generation Smart ForTwo and revived its ForFour nameplate. Rounding out the top three was Jaguar, which increased year-on-year sales 41 percent because of strong demand for its XE entry model. The overall surge in European sales lifted 28 of the 33 brands tracked by European automaker association ACEA. In addition, 17 of the 28 grew more than the overall market. The biggest loser was Chevrolet, which parent General Motors finished closing down in Europe, ending an 11-year run with full-year sales of just 3,521 vehicles. Volkswagen Group’s admission last September that it had cheated on emissions tests had a limited effect on sales at the automaker’s namesake brand. VW remained Europe’s No. 1 brand by a wide margin, although its sales did not grow as fast as the overall market, and the automaker’s market share fell to 12.2 percent from 12.5 percent in 2014. The Ford brand retained second place, with sales up by 8.6 percent to 1.02 million units, according to ACEA’s figures. 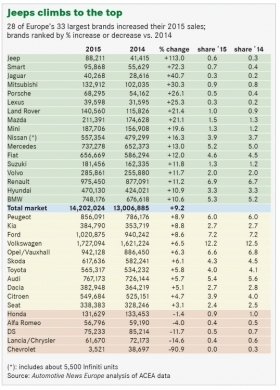 Renault passed Opel/Vauxhall to finish 2015 in third place in brand sales. The French carmaker increased its volume 11 percent to 975,450 units while GM’s European arm rose 6.3 percent to 942,128 units. At automaker group level, Jaguar Land Rover outgrew all rivals. The British luxury carmaker increased sales by a quarter to 180,828 units. Land Rover accounted for 25,000 of JLR’s 36,000-unit sales increase last year. The biggest contributor was the new Land Rover Discovery Sport. Daimler came in second as sales climbed 18 percent to 833,146 units. Along with the added volume from Smart, Daimler’s growth was fueled by a strong demand for the new Mercedes C class. Helped by its namesake brand and the continued growth of Jeep, Fiat Chrysler was third in year-on-year sales growth by a group. Fiat Chrysler also was the only volume brand in the top three. Its sales were up by 14 percent to 872,504 units. In the overall group ranking, VW kept its commanding lead with full-year sales of 3.5 million vehicles, but all its brands grew less than the market average. As a result, VW Group’s share slid to 24.8 percent from 25.5 percent in 2014. Renault-Nissan was Europe’s second-largest automotive group with a volume of 1.92 million units. PSA finished third with almost 1.5 million sales. Although European sales were much better than expected last year, the region remains in recovery mode because 2015’s volume was still 1.8 million sales less than the 16 million total reached during the market’s peak in 2007. 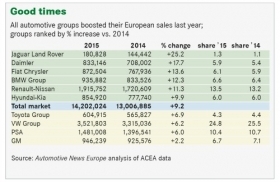 Nevertheless, Europe sales rose by 1.2 million last year. Said another way, that increase preserves the existence of eight vehicle assembly plants with capacity to produce 150,000 units a year. One of the key indicators of an automaker’s success is its ability to keep its plants at or near their production capacity. Experts say that a plant needs to produce at 75 percent to 80 percent capacity to break even. If the manufacturer’s entire network of plants is producing below that number, it is nearly impossible for the company to make a profit. Ford, Opel, Volvo and PSA/Peugeot-Citroen closed car plants during Europe’s six-year sales slump (2008-2013), but analysts estimate that the region still has 25 percent more production capacity than is needed to satisfy customer demand. A closer look at the full-year sales figures provided some additional insights. While Mercedes outsold Audi globally in 2015 the VW Group subsidiary remained Europe’s top-selling premium brand. Audi sold 767,173 vehicles finishing ahead of BMW (748,176) and Mercedes (737,278). The gap between the German premium brands and the next-highest-ranking luxury carmaker – Volvo – was more than 450,000 sales. Nissan came up short in its bid to overtake Toyota as Europe’s No. 1 selling Asian brand. Nissan led the race after 10 months but Toyota regained the lead in November and held on in December, finishing the year 7,963 sales ahead of its rival. By comparison, Toyota topped Nissan by 50,197 sales in 2014. Honda was the only Asian automaker to suffer a sales decline last year, with a 1.4 percent drop to 131,629 units. Honda’s decrease combined with Mitsubishi’s 30 percent sales surge pushed the SUV specialist ahead of its rival for the first time since 1991.